This article is reposted from the old WordPress incarnation of Not Exactly Rocket Science. 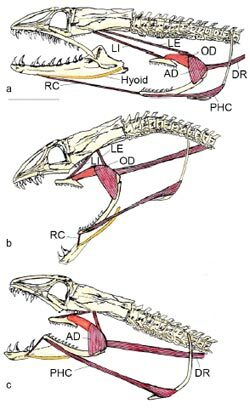 These ‘pharyngeal jaws’ are housed in the eel’s throat. When the main jaws close on an unlucky fish, the second set launches forward into the mouth, snags the prey with terrifying, backward-pointing teeth and drags it back into the throat. In fractions of a second, the prey is bitten twice and swallowed (see this video for more). This was one of my favourite discoveries of recent memory. It’s especially amazing given that moray eels are relatively well-known fish that are housed in aquariums the world over. The fact that their amazing feeding abilities were only discovered a few years ago (rather like this year’s story about venomous Komodo dragons) is testament to how much we have yet to learn about seemingly familiar animals. Rita Mehta and Peter Wainwright from the University of California, Davis relied on high-speed footage and X-ray videos of striking reticulated morays to discover their secret weapons. For the moment, moray eels are the only fish, and indeed the only back-boned animals, to use this extraordinary hunting innovation. Other bony fish have pharyngeal jaws too, but theirs are small and immobile – nothing like the ballistic set that morays use. They merely sit in the throat and help the fish to swallow prey it has already engulfed. To get food into their throats in the first place, most fish use a technique called suction feeding. By rapidly expanding their mouths and sucking in water, they turn their heads into living hoovers, drawing in a steam of water that carries the hapless prey along with it. But suction feeding isn’t an option for morays. They live in tight rocky alcoves that leave little room for expanding their heads. They can’t generate enough suction, and even if they could, their prey are large and strong enough to be able to swim against it. Instead, they have evolved a unique technique that serves them much better. The muscles that power the pharyngeal jaws are a key part of this. They have stretched over time so that they are much longer than those of other fishes, and can propel the jaws across the entire length of the eel’s skull. The moray’s large head houses powerful jaw-closing muscles that deliver formidable bites. The sharp long teeth of the main jaws are excellent for gripping so that even if the eel sinks just a few of these in, its prey is trapped. The teeth on the pharyngeal jaws are designed to drag the prey further in. They are terrifying in appearance (below), recurved, sharp and backward-pointing, like a bird of prey’s talons. With adaptations like these, the eel has no need for suction feeding. Of all the world’s back-boned animals, only snakes use a similar technique to the morays. Once they’ve killed their prey, they separate the left and right halves of their jaws which independently crawl over the animal, ratcheting it down the snake’s throat. Mehta and Wainwright believe that snakes and morays evolved such similar strategies to cope with the limitations of a long, slender body plan. Both techniques allow the animals to keep a strong bite on their prey at all times. This predatory innovation, straight out of the realm of science fiction, may have contributed to the morays’ success. There are about 200 species of moray eel, and they all occupy a firm position as top predators of coral reefs. Reference: Mehta & Wainwright. Raptorial jaws in the throat help moray eels swallow large prey. Nature 449: 79-82. Images from Nature paper, courtesy of UC Davis.